This was my first time participating in the Army Run and know I totally understand why it is such a popular race. The Canadian Army puts on an amazing, well organized race. It is very inspirational to run alongside active and retired members of the military, including many ill, injured, and disabled athletes. The race is very family friendly with fun activities for kids, displays of military equipment, live music, and a good sized race expo. The course is also beautiful, which reminded me how lucky we are to live in Ottawa. 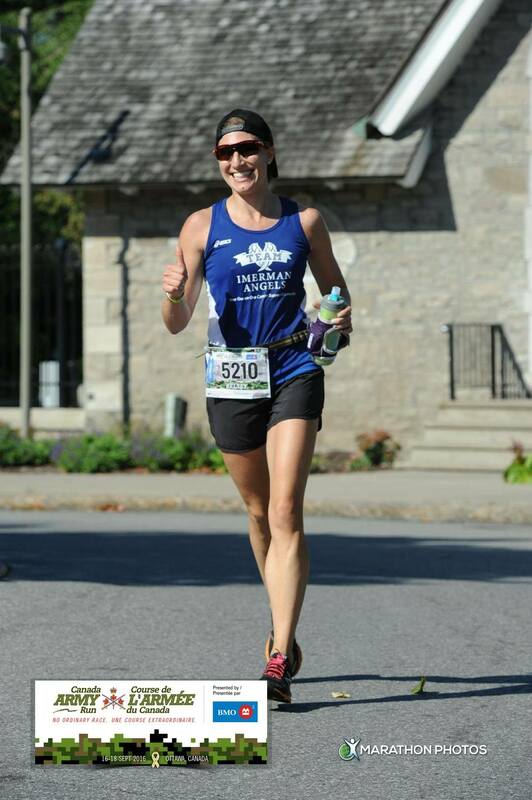 I run most of these roads every week, like the pathway that winds along the Ottawa River and the Canal, or over the picturesque Alexandria Bridge with its view of Parliament, the Canadian History Museum, the National Gallery, and my office (haha). Well, I went in to the race with very low expectations for my finishing time. I knew that I couldn't expect a PB, given that my body really doesn't know how to run fast right now and that I hadn't trained for a PB. Since Timberman, my longest run was about 12k and I had only done 3 tempo sessions. Running a half marathon in the morning. I've been worried about not running it as fast as I would like, but had a realization today - this race isn't about me and it's certainly not about a PB. I signed up for this one as a fundraiser for a charity I feel very strongly about. This race is about having fun in support of an important cause. And it's about the 4 friends and family members that battled hard against cancer over the past 2 years that inspired me to get involved with Imerman Angels, and the many before them and the many that will have to face their own battles or support someone through cancer in the future. So I'm running for them. And of course, because it's the Army Run, I'm running for the courageous men and women of the military, who put themselves in the face of danger for us everyday. So I did exactly as I said... I had fun and when my legs got tired, I thought about all the courageous people who face cancer every day all over the world. I wouldn't necessarily recommend it, but my "strategy" on Sunday was to just run and see how long I could hold on to a decent pace. My goal was to run faster than 8:00 miles if possible, or as close to it as I could for as long as I could. Looking at my 5k splits, you'll see exactly where the wheels started to fall off! The first 10k went pretty smoothly. My legs felt strong and overall, I felt good despite what was turning out to be a very hot, humid morning. The course had tons of people along it cheering, as well as official cheering stations, which was helpful. My only complaint was that there could have been one or two extra aid stations, especially given the heat, but I think I was spoiled at Timberman, where there were a ton of aid stations. 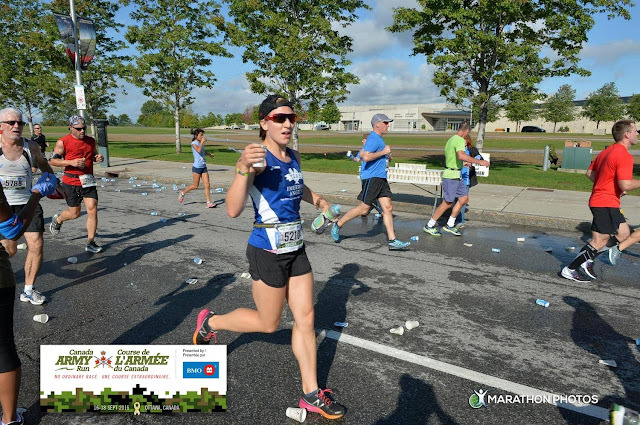 I was carrying a bottle with electrolytes in it and grabbing two to three cups of water at each station - some in my mouth, and the rest over my head. At the 10k mark, we had a steep climb up the Alexandria Bridge, and that was when my legs decided they weren't going to bring the pace back down. Luckily there were tons of people at the end of the bridge around the National Gallery, so I did get a little boost there. Then we ran by my office and towards Rockcliff, which was awesome because we actually had quite a bit of shade in Rockcliff. At 13.5k, I saw Chris Koch. It was so inspiring to see him crushing the course on his longboard. Chris was born without both arms and both legs, so he was doing the full Commander's Challenge - 5k plus 21.1k on a longboard. Truly amazing! Then at 15k, I got to give the Governor General David Johnston a high-five outside Rideau Hall (his house). As we ran back along Sussex Drive, the winds really picked up and I started to hit a wall. My legs weren't turning over the way that I had hoped and I started to struggle. At 17k, my stomach decided it had enough too and a bit of nausea set in, making the last few kilometers quite uncomfortable. As much as I kept telling myself to speed up and just use up whatever was left in the tank, my legs just weren't up for it. The last few k seemed to take an eternity, and finally, finally the finish line was in sight. 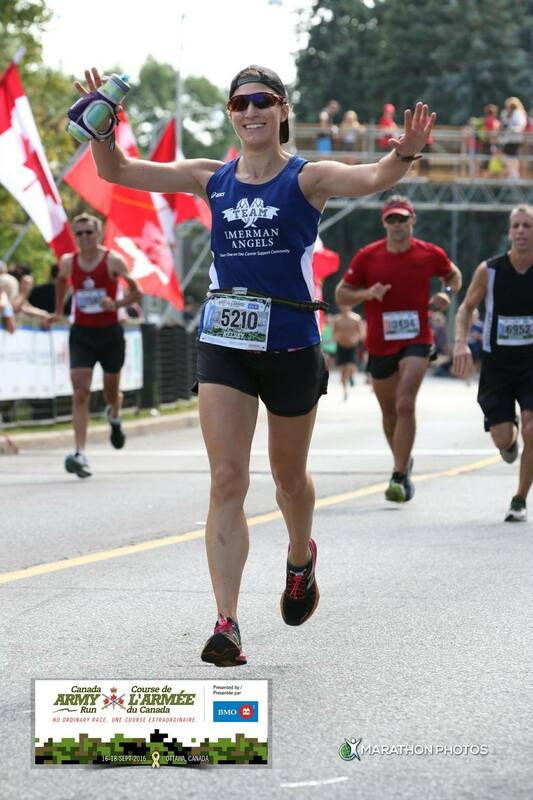 Instead of speeding up, I just smiled and relished the people cheering, the Canadian flags lining the chute, and the fact that I was healthy enough to do a half marathon. After crossing the finish line, I got my dog tag finisher medal from one of the military members and thanked her for her service. For the first time ever, I grabbed a space blanket since I was soaking wet and afraid that I would get too cold post-race. After filling up on as many water cups as I could hold, I found a few OTC friends and one of my favourite former colleagues. I was definitely happy to be finished that race, but all in all had a pretty good time! Final time was about 10 minutes off my PB, but also 10 minutes faster than my half marathon at the end of Timberman, so I'll take it! Thank you to Brent Smyth for encouraging me to get involved with Imerman Angels. Thank you also to the amazing Army Run volunteers and to our Canadian military, past and present, who serve our country and protect us all day in and day out. 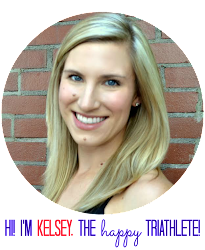 Thank you to the supportive, amazing women of Team Coeur Sports, who inspire me everyday. On the Friday after my first half iron distance race, I sent an innocent email to the race director of the Cornwall Triathlon, inquiring if there were any spots left in the Sprint Tri. I was planning to travel to Cornwall to cheer on my roommates anyways, and Cornwall holds a very special place in my heart (first triathlon ever and first race back from stress fracture last season). But I was expecting to hear that the race was sold out (it usually is, for good reason)... and instead Rob wrote back that he had "made some spots" in the sprint. "Okay, I guess I am racing then," I thought! 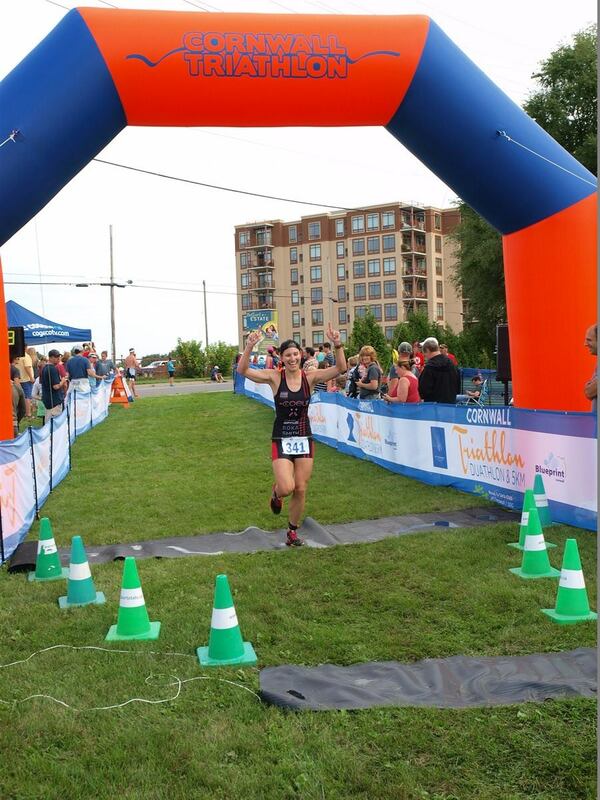 Two days later, on Sunday, just a week after Timberman, I did the Cornwall Sprint and I am so happy that I did! As always, the organizers and volunteers put on a fantastic event. For a local race, they really give the athletes a first-class / luxurious experience. It is inspiring to see how supportive the community is of the race. Thank you so much for taking such good care of us! Cornwall race day is pretty easy. We woke up early in order to hit the road by 5:45/6 am for the hour and 15 minute drive. Our car was packed with athletes, bikes, and gear since it was Jenn, Gilly, Gavin, and I making the trip down to race. The second we arrived in Cornwall, the rain started to pour, which made setting up for transition a little bit more interesting. After I paid my race fee and got body marked, I decided to settle in to a spot in the lobby to relax while I waited for my race, which didn't start until 9:50. The Olympic went off much earlier, so Jenn, Gavin, and Gilly had to set up and get ready to race. As I waited, I got to say hi to my Coeur teammate, Amy, who had made the trip up with some other athletes from her triathlon club. It was nice to see her again, just one week after Timberman! (She went on to win the Olympic!) The rest of the pre-race time was spent relaxing and staying dry. Swim exit photos... so flattering LOL! 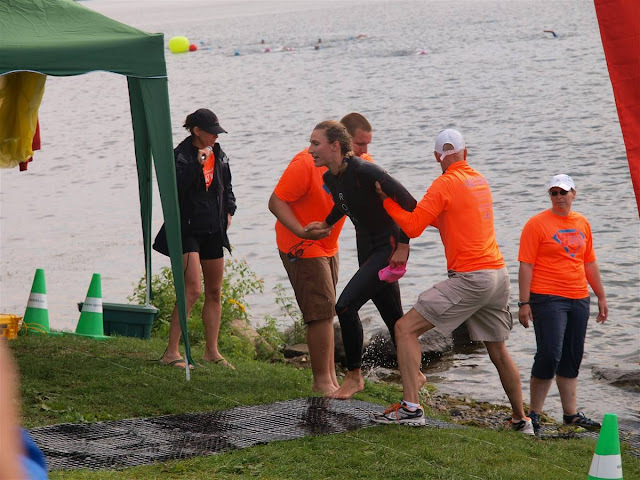 T1: The run out of the water was lovely this year, as they had laid down a red carpet (literally) for us to get to the transition zone. I missed the wetsuit strippers, so had to get my wetsuit off myself (not too hard with the Roka Maverick!). My swim to bike transition has always been a little bit slow, and was again this time around, but that is okay. 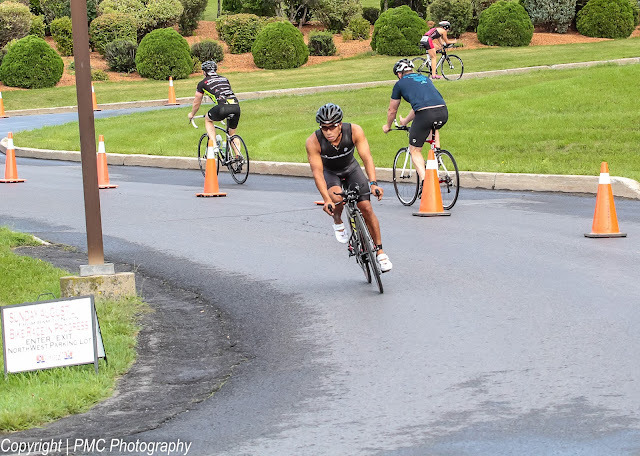 Bike: I could definitely still feel some of the effects of Timberman in my legs during the bike leg, as I just couldn't quite get the speed going that I wanted. There were lots of men drafting (on me at times!! ), which was kind of frustrating, and I ended up taking the turns quite slow given that it had been pouring a few hours earlier and there was still water on the ground. But all in all, the bike went well. My number one goal was to stay in the lead and not let any women pass me, so it was a success! That's me way up on the hill. Thanks to PMC Photography for the excellent photos! T2T: One of my fastest T2s ever! In and out and on the run! Run: The run was going to be all about giving a solid effort. At that point, I really wasn't sure how my legs would hold up and again, all I wanted to do was hold off the rest of the women. The volunteers were again just so awesome as were the spectators. I had no clue of my actual speed, since I turned my Garmin on inside the gymnasium during the rain before leaving it in transition, so it was only showing the time with no pace. So, I focused on trying to keep the legs turning over strong and staying in the game the whole way. At the turn-around, I knew I had a pretty solid lead and as I approached the finish, I couldn't help but smile and relish my first overall female win! There are a lot of reasons that Cornwall is one of my favourite races, and the whole experience of the day confirmed those reasons once again. Thank you to Rob for "making a spot" for me to race. It was fun to test the limits of what my body was capable of the week after my first half ironman. We can definitely blame the post-Timberman endorphins for my somewhat rash decision to race again so soon, and I'm just glad that my body was ready to perform again. 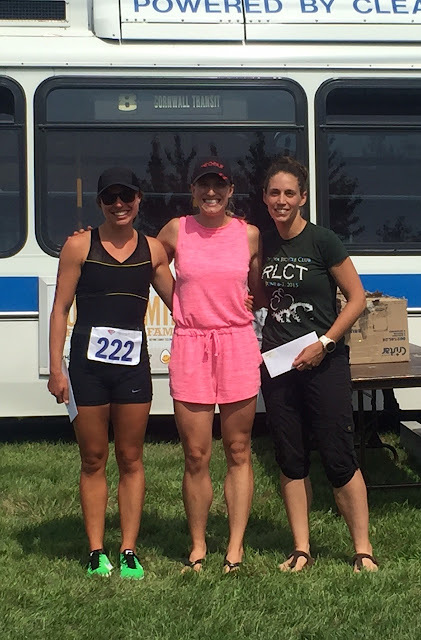 As always, it was so fun to be out on the course with so many friends and teammates - from Ottawa Triathlon Club to Team Coeur Sports! Congratulations to everyone who raced and thank you again to the volunteers and organizers!